Summary: North Carolina’s law requiring voters to show ID’s was ruled unconstitutional in 2016, but lawmakers are trying to revive the provision with a state constitutional amendment in the November elections. After being struck down just months ahead of the 2016 election, North Carolina’s voter ID law has made a triumphant return. The proposed state constitutional amendment that voters will decide on Nov. 6 is expected to pass, with nearly 70 percent of adults in a September High Point University poll backing the proposed amendment. At first glance, it’s an idea that makes sense—voting is a fundamental right that should be protected. One needs an ID to get on an airplane or buy alcohol, so why is voting an exception? However, evidence suggests the Voter ID law is at best a politically-motivated move. First, the concept of voter fraud as rampant is itself fraudulent. A 2016 North Carolina state election audit turned up just two cases of voter fraud. Two. Moreover, many national studies suggest scant evidence of voter fraud. President Donald Trump even dissolved his voter fraud commission after it found no evidence of mass voter fraud coming from undocumented immigrants. According to its findings, Trump had falsely claimed that between three and five million votes were cast illegally. In addition, opponents of voter ID laws have been arguing that they suppress turnout, especially among black voters. One recent study has shown that blacks are roughly twice as likely to be blocked from voting due to lack of proper ID. The nonpartisan Government Accountability Office also found evidence that voter ID laws also do decrease overall turnout. Precisely because it considered the North Carolina voter ID law to be discriminatory, a federal appeals court struck down the law in 2016. Data demonstrated that blacks “disproportionately lacked the most common kind of photo ID,” usually the ones accepted at the DMV. In an initial version of the bill, all government-issued ID’s would have sufficed. But once the data was released, the bill was changed to “exclude many of the alternative photo IDs used by African Americans.” The court concluded that law was discriminatory. “Faced with this record, we can only conclude that the North Carolina General Assembly enacted the challenged provisions of the law with discriminatory intent,” the appeals court ruling read. A few years later, the new proposed amendment is shockingly scant on details—not more than three lines long. “Voters offering to vote in person shall present photographic identification before voting. The General Assembly shall enact general laws governing the requirements of such photographic identification, which may include exceptions,” the amendment reads. The first voter ID law, which was passed in 2013 before being struck down two years ago, was chock-full of details. House Bill 589 spelled out which ID’s were acceptable, noted procedures for exceptions and determining “nonreasonable resemblance of photo identification.” In doing so, it provided strong evidence for the federal appeals court to stop the discriminatory law in its tracks. For now, it’s hard to say what the final details of the amendment will look like, in terms of what sort of identification will be acceptable, and what sort of exceptions will be allowed. For the law to survive a federal court challenge, it must be foolproof. Two other states—Missouri and Mississippi—have also enacted voter ID constitutional amendments. Thirty-four states have voter ID requirements of some kind, but only those two states have incorporated such regulations into their constitutions. Missouri and Mississippi’s amendments that hit ballots—which have so far largely survived court decisions—are very similar to North Carolina’s new amendment. They simply note that valid ID would be required to vote and allow for potential future exceptions. Both states have also provided support for those that do not have ID’s. Mississippi crafted the law alongside the U.S. Department of Justice, a law which in implementation included free rides for eligible voters to get free voter ID cards. It also didn’t include a charge to verify birth certificates, a provision included in a Texas voter ID law that was rejected by a federal appeals court. Missouri’s law is in the midst of a court battle, but has weathered the storm thus far due to a requirement that it assist voters in getting a free ID in order to vote. One portion of the law requiring voters without a photo ID but presenting a non-photo ID to sign a “misleading” statement was struck down October 9, but a judge upheld the meat of the amendment. Missouri Attorney General Josh Hawley, who wants to revive the portion of the law struck down, is appealing the decision. 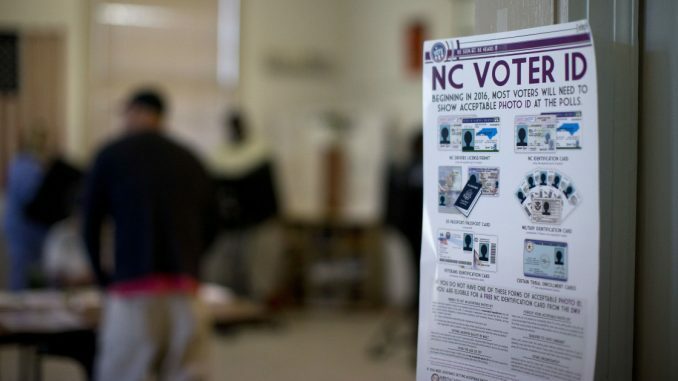 Upon reflecting on previous attempts to limit ballot entry by voter ID, it is evident that North Carolina lawmakers will likely again try to include a way for voters to access free ID’s that need them. It will have to open up the process for those that don’t have the means to get ID’s. It could very well contain a relatively healthy list of exceptions in order to safeguard the law. There is plenty of precedent for them to find out which sorts of laws stick, even when challenged in court. If they make these sorts of changes, voter ID may be here to stay. Author Bio: Ben Leonard is a junior from San Mateo, C.A. He majors in public policy with a certificate in Policy Journalism and Media Studies.